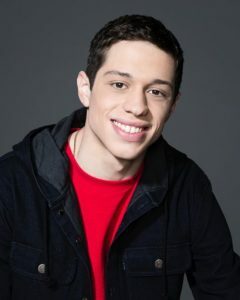 Pete Davidson is an American stand-up comedian and actor, best known as a cast member on the television comedy show Saturday Night Live (SNL). Pete was the first SNL performer to be born in the final decade of the 20th century. Pete’s other well-known television credits include Wild ‘n Out, Failosophy and Guy Code on MTV and Comedy Underground with Dave Attell. Born Peter Michael Davidson on November 16, 1993 in Staten Island, New York, to Amy Waters and Scott Davidson, he was raised Catholic. He has one younger sister named Casey. Pete completed his schooling from St. Joseph by-the-Sea High School, Tottenville High School, and Xaverian High School in Brooklyn. Following his high school graduation, he attended at St. Francis College in Brooklyn Heights, New York, remaining briefly before dropping out. He got his start playing a variety of roles on MTV shows. In May 2018, he began dating singer Ariana Grande. The couple got engaged in June 2018. They ended their engagement in October 2018. He previously dated Carly Aquilino (2014-2015) and Cazzie David (2016-2018). Religion: He was raised Catholic. *He was born on November 16, 1993 in Staten Island, New York City, New York, USA. *His father, Scott Davidson (New York City firefighter), died during the 9/11 attacks. *He was discovered by Nick Cannon when he was 17 years old. *He joined season 40 of Saturday Night Live. *He was on the Forbes 30 under 30 list in 2016.